2019 Summer/Fall Special - $130 USD per night plus tax for 7 or more night stays for parties of 2 - Additional $7 per nt for each additional person(s) up to 4)). Cable TV in both rooms. Flat panel HDTV in bedroom, as well. Blender, Toaster, Coffee Maker, etc. Large Private Lanai, FREE Parking, Beach Chairs/Towels and Cooler Provided, Iron and Ironing Board. Remodeled bathroom with granite counter tops and custom walk in tile shower. Our spacious one bedroom luxurious ocean view condo at Kihei Bay Vista has everything you need to relax and enjoy your vacation on Maui. This luxury decorated fully remodeled, Wall air-conditioned unit has new tile flooring, vaulted ceilings and a king-size bed with large walk-in closet. Our second floor unit is located in a small low rise two-story complex with lush tropical landscaping. Check in 3 PM. Checkout 11 AM. 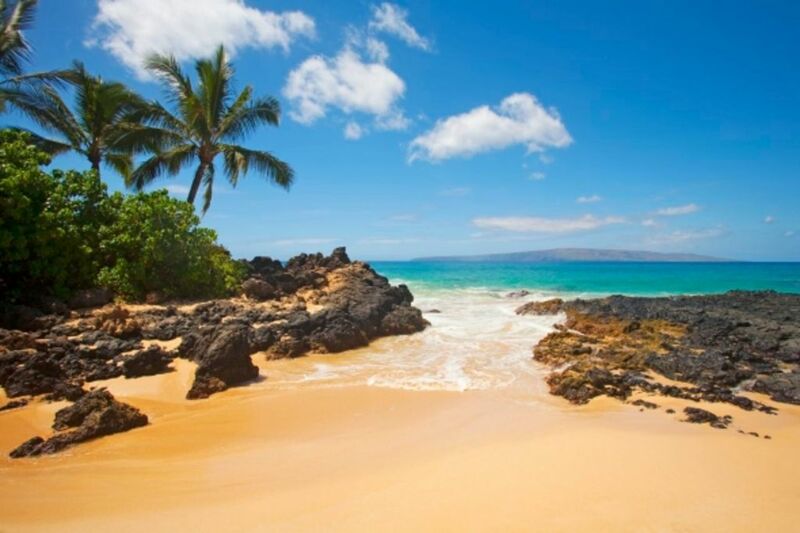 We are only a few steps from Sugar Beach and Kamaole Beaches which is connected to the longest continuous beach on Maui and directly across from the Hawaiian Islands Humpback Whale National Marine Sanctuary. Also, you are just steps from a large swimming pool and jacuzzi. This is often a great place to watch windsurfers flying across the waves. We are also conveniently located close to dining and shopping. We are in the most centrally located part of the island which is close to all points of interest. Most flights leave Maui late in the evening. We recommend booking your last day of travel in our accommodations, so that you will have a place to stay until leaving for the Maui Airport. The airport code for Kahului, Maui is OGG. What this means is that we recommend if you do have a late night flight it is best to book the night of departure so that you can have use of the condo until you leave for the airport. Late Check outs are not available. There is a $75 fee for parking permits that are not returned to the unit upon departure. Any lost parking permits or permits that are left in rental cars are subject to this $75 administrative fee. We recommend any packages that you have shipped to our condo come by Fed-Ex or UPS. You will not be able to retrieve USPS packages while staying in our unit. If you must use USPS, ship to General Delivery Kihei, HI 96753. 10 night minimum during the Christmas Holiday Period. Please call if you have problems with the quoting system or questions about the time period. We are somewhat flexible on which 10 nights can be booked. January - March have 7 night minimums, unless it fills a hole for lesser time. We have been spending time on Maui for over 28 years. We live on Maui full-time. When you stay in one of our units, you will sense the owners pride that we take in caring for our properties. We are not just property owners. We are Certified Maui Destination Specialists by the Maui Visitors Bureau and long-time members of the Hawaii Visitors and Convention Bureau. Please visit our website to find out why you won't find more luxurious vacation condos on Maui at our rates. The Kihei Bay Vista in north Kihei is one of the most centrally located spots on the island of Maui. We are directly across the street from the longest continuous beach on Maui (known as Sugar Beach) which is over 5 miles of continuous beach with no buildings to obstruct your walk. We are out of the hectic busy part of Kihei but less then a mile from all that Kihei town has to offer. Lush Tropical Landscaping. Beautiful pool and spa. Across the street from the Hawaiian Humpback Whale Museum. Close to shops, restaurants, and activities. We’ve stayed here several times and love it. Mahalo Nui Mark for your continued business. We always enjoy having you as our guests. Well maintained with modern upgrades. We would go back to this property. It has all of the conveniences we were looking for, full kitchen, washer and dryer, central location and good price. Only suggestions would be new bed pillows and replace the window air conditioner with a two zone ductless mini split in the living and sleeping area. Mahalo Nui Kyle for your positive feedback. We appreciate you taking the time to provide this. We will replace the bed pillows ASAP. Also, we are looking into installing a two zone split AC unit for the future. We stayed for 1 week in Kihei and this unit was really nice. They had everything you needed, from plastic wrap to a printer. It was very clean and in a central location near the humpback whale foundation. Mahalo Nui Carol for your positive feedback. We are so happy you enjoyed our condo and the area in which we are located. Mahalo for your business. We hope and pray you can get your life back and rebuild after that devastating fire in Paradise. This condo is well located in the Kihei area of Maui. It is just seconds from a quiet, expansive beach from which you can enjoy the water, play in the sand, sun tan and watch the nightly sunsets without interference. It is just minutes from the Maui Nui golf course and good supermarkets, restaurants, handicraft/souvenir shops and various tourist services (whale watching, snorkeling, bike rentals). The condo itself is clean, appropriately laid out and well equipped with lots of dishes, cutlery and kitchen tools. The bathroom has an excellent, powerful walk-in shower. The bed is comfortable and there were lots of towels and linens. The condo is equipped with several foldable beach chairs, a couple of tennis rackets and some fishing equipment. The north facing condo is a bit dark but reasonably cool and opening the screened lanai door and bedroom windows allows a lovely cross breeze minimizing the need for the air conditioning (which we used for less than an hour a day). I had some initial struggles with the TV but the owner was quick to call and get me on the right path. The common pool is large and the chaise lounges, chairs and tables in the pool area make it easy to suntan or sit in the shade and read and/or nap.There are only two things that were problematic: (1) we wished there were more operable (free) TV stations, and (2) there is some traffic noise from S. Kihei Road. Neither of these were of great concern because we spent most of our time out of doors. The condo was clean and well maintained. The listing and description was accurate. The price was appropriate and reasonable and we have no difficulty in recommending this condo. Mahalo Nui Lloyd for your positive feedback. It was a great Condo in a very good place. Easy access on the beach and other places! Great place to spend your vacations. Very impressed with the Condo and all necessary required equipment(for beach and kitchen). Living room, kitchen and bedroom was nice and clean. The owners were nice and always responding to your calls. We really enjoyed staying 10 days on the Condo. Tim & Vicky thank you very much sharing your place with us! Greatly appreciated! Mahalo Nui Riti for your positive feedback. We enjoyed having you as our guests. The condo was in the middle of all the fun adventures/attractions. It was easy to find, the pool was awesome, and having a beach across the street was great too. We enjoyed our stay here!! Mahalo Jeff for your positive feedback. Close to Maalaea harbor for snorkel, sunset, fishing, whale watching and dining cruises. Close to Maui Ocean Center Aquarium. We are in the most centrally located part of the island, close to all Maui attractions. Airport is only 10-15 minutes away.